They are going to make a movie about the life and career of NFL great Johnny Unitas and none other than Joe Flacco is going to get to play the part… at least for the final action scenes anyway. Still in all… to be Johnny Unitas, just for a little while, has been the dream of every young football player for the past 50 years. He was the best of the best and those of us who were lucky enough to have seen him in action will never forget the day. 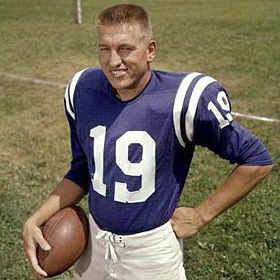 Unitas spent most of his pro career in Baltimore playing for the Colts. He was originally drafted by the Steelers in 1955 but then head coach Walt Kiesling thought him not smart enough to play in the NFL and cut him before the season even began. Legendary coach Weeb Ewbank of the then Baltimore Colts hired Unitas after he and his buddy Jim Deglau had borrowed gas money to get to the Colts’ tryouts… and the rest is football history. Unitas stayed in Baltimore for the next 16 seasons bringing both fortune and fame to the team and the organization. He was a 10 times Pro Bowl Quarterback and 3 time winner of the Pro Bowl MVP Award. In 1970 Johnny Unitas was named the NFL Man of the Year. His jersey #19 has been retired. Fittingly enough, the filmmakers have turned to another winning Baltimore quarterback to fill in on the field for the actor playing Unitas for the filming of the final action scenes which will depict the 1958 NFL Championship game in which the Colts beat the New York Giants by a score of 23-17. Joe Flacco gets to play the role of Unitas on the field. After winning the Super Bowl and being named MVP, Joe Flacco is riding on a pretty high crest these days. He has been somewhat vocal about his lack of recognition as being a top flight pro quarterback in the past… but, that has now been put to rest. For the time being, Flacco is the highest paid player in the history of the NFL. He probably isn’t going into acting for the money. But, to play Johnny Unitas out there on the gridiron now that is going to be something else again. The movie will be called “Unitas We Stand” and is scheduled to be filmed this summer.